My list making and organisational tendencies obviously extend to a love of packing, therefore I usually begin a week or so before by laying out my suitcase somewhere out of the way in my bedroom. I can then put things in as and when I come across them in the house. When packing for long haul flights I tend to make sure have everything really well organised so that I can sit back and enjoy the sheer luxury of having nothing to do for 8 straight hours. For entertainment I take my Kindle (loaded with a nice mix of holiday junk literature and Booker prize winners, see below for what I am taking to read) and my iPod (playlist also below), I don’t travel with iPads or even smart phones as they are heavy and liable to getting stolen or broken when travelling, plus wifi is always a bit hit and miss and 3G ruinously expensive abroad. Besides, I like to switch off fully when on holiday and go off grid, no Facebook or any of the usual wastes of time. For comfort I always take a big greige pashmina that doubles as a lightweight blanket. It’s always like the arctic on the plane and those blankets they hand out are made for people more petite than me. I like to bring some snacks regardless of whether I am flying cattle or club class as I don’t always want what is served and food means too much to me to leave it to chance. I tend to lean towards cashews and peanut M&M’s rather than mung beans and goji berries. I take noise cancelling headphones (just £20 jobbies) to help reduce the endless racket of the engines and other passengers. They also came with an adapter that lets them be used in those annoying planes that have special 2 prong jacks, to stop us using our normal headphones and force us to pay for their inferior ones. I take the obligatory blow up pillow and a comfortable eye mask for night flights. I also pack Werthers Originals for when the plane descends so I don’t get that awful underwater hearing. I carry wipes with me everywhere, even before I had 3 kids I could be relied upon to need to to wipe up something, so these are a must for me. For the more boring stuff, it’s just all the travel paperwork in a see through file (I tried a stylish leather “travel wallet” but it never fitted everything in and took up too much space, a exemplary case of style over design.) I have a small wallet I use just for going on holiday, that contains my Boots Advantage Card and cash in both my home and holiday currency. 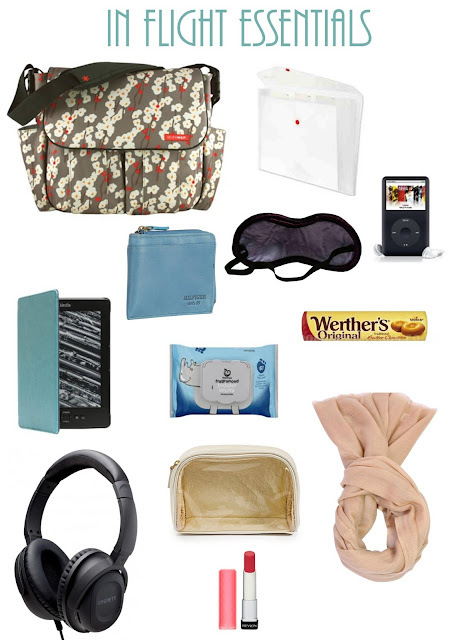 I have a great nappy bag Skip Hop Dash Deluxe Diaper Bag,Cherry Bloom that I always use when travelling, stuff the fancy Bayswater, it’s a nightmare to find anything in when crammed on a plane and I can sling the nappy bag over my body if I need to run to catch a connection. I am a hell of a lot more minimal on holiday, I tend to not wear foundation, just waterproof mascara (of which I have never found a really good one), and a decent lip balm (Revlon Lip Butter rather predictably.) I find any pre-grooming always pays dividends though, so I do a DIY manicure and pedicure and have my hair coloured and trimmed. I also must admit for 2 week prior to my holiday I use sunbeds 3 times a week so I have a base tan. This is part vanity, part common sense. I am not one of those people who can sit there slathering on the factor 50 all day, I HATE the feeling of sunscreen on my skin, it is so greasy and thick. So I try to find spray oil ones and get a pre-tan so that my skin has had chance to develop some of it’s own protection. This stops me getting burned on holiday (which is apparently the worst thing you can do for your skin) and gives me some colour for the first few days so I don’t go crazy lying out in the sun to get a tan. I nearly always lie with my head in the shade to protect my face and so I can read without squinting. I suffer from psoriasis that reacts favourably to sunlight so when on holiday I tend to wear my hair up to allow the light to reach all of my scalp. I wear my hair up maybe once or twice a year otherwise so this is a big change for me. As I have mentioned ad nauseum, I have very fine, flat hair so I tend to go for messy unstructured up dos to give some much needed volume, I also find it easy to maintain when swimming etc… I take Aussie 3 minute miracle with me to treat chlorine and sun damaged hair. I find this stuff really works, i leaves my hair sift and silky after a day of crispy, sticky scruffy hair. My favourite facial sunscreen is Cellex C Suncare SPF30+ It feels thicker than my usual moisturiser but not as heavy as a usual sunscreen does. I don’t end up with parched skin after using it, that dry, tight feeling just doesn’t happen and I never get a red, face even if I only remember to put it on once in the morning. I am absolutely not a shorts girl, someone with the generosity of thigh that I was gifted with, should steer well clear of shorts. I do wear a lot of dresses though, I try to find ones that require no ironing and that don’t cling too much so I can enjoy my food on holiday without fretting too much about bloating. I tend to favour strapless bikinis to avoid tan lines, and obviously ones with a higher waistline than usual (though not grannily so) due to mummy tummy issues. Clive Cussler – Atlantis and Inca Gold, for those of you who like me have never read his works before, they are like Dan Brown style action/history adventure books. Michael Crichton – Next, so sad he died, I loved his books. Diane Setterfield-The Thirteenth Tale – Actually, I will probably have finished this when I get there but one of the best books I have read in ages. Gillian Flynn – Dark Places -I really enjoyed Gone Girl (along with three quarters of the adult population) and so am looking forward to this. Alain De Botton – Religion for Atheists: A Non-believer’s Guide to the Uses of Religion – I am an Atheist but I raise my children Catholic (Catholic Husband) and I also attended Catholic school. I think religion has so many important parts to play in life I just hate all the judgement associated with it and am actively feminist (female priests really need to be allowed) and I wholeheartedly support gay rights (which of course would fit well with the Catholic priesthood you’d think!) I thought this would be a great book for me and appeal to my disparate viewpoints.